GPU Shark is a small graphics card utility which displays some vital information about your display adapter. 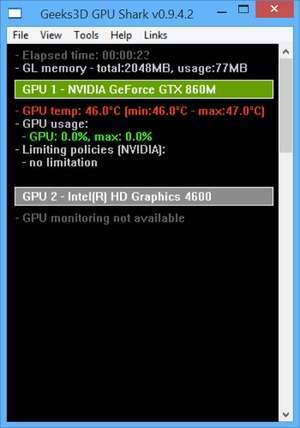 The user interface of GPU Shark is pretty basic and the initial display includes core details about the graphics chip including the GPU temperature, usage percentage and limiting policies. If you have multiple graphics adapters installed, GPU Shark will also display the details about any secondary adapters. If you click on View > Detailed Mode, GPU Shark will also display extended information like driver details, memory size, Bus ID, GPU cores, ROPs, texture units and details about currently running 3D applications. Version 0.13.0.0 is a freeware program which does not have restrictions and it's free so it doesn't cost anything. For security reasons, you should also check out the GPU Shark download at LO4D.com which includes virus and malware tests. Additional screenshots of this application download may be available, too.